Every home has a title, which indicates who has rights to the property. A title company handles the transfer of rights and ensures that no one else has access to your property. At Team Lucky Duck, we have had great experience using Global Closing & Title with our clients. Today we have the owner, Charlie Lawson, here to answer some questions. Team Lucky Duck: How did you get into the title business? Charlie Lawson: After working as a welder for 5 years, I moved into the mortgage business. From there, I transitioned into title and have enjoyed it ever since! TLD: What is a Title Policy? CL: It protects the owner’s rights to the biggest investment of their life. It ensures the buyer that everything is free and clear as the title is passed on from the previous owners. TLD: Can you give us an example of a situation where title insurance would come in handy? CL: Absolutely. Let’s say 20 years ago the title to the home you’re currently living in was not transferred correctly and an ex-wife was left on the title by mistake. She would still have interest in the property. With title insurance, the title company would handle all the necessary measures to remove any prior interest from the property and leave you with a clean and transferrable title at the end of the day. Another scenario we recently dealt with was in a new construction situation. A builder was forging lien wavers (paid invoices) before closing and the unpaid liens were filed against the properties they were building. Upon closing, the new owner was held responsible for those debts, which would have been a nightmare. However, with title insurance, their policy kicked in and the title company soaked up all of the attorney bills required to fight those liens and hold the construction company responsible. I understand that like a lot of insurance policies, it can feel like a waste of money until you need it. TLD: Why would someone use a title company versus a lawyer in a real estate transaction? CL: Neither is a bad choice, however a title company comes with specialized expertise and is more cost effective. Lawyers typically have a wide variety of cases in a typical week, whereas we only do title and we do it well. TLD: What sets Global Title apart from other title companies? CL: I started Global Title in 2007 because I thought the industry needed an attitude adjustment. Global Closing & Title revolves around the customer, not the other way around. People can’t always take off work to get help from a title company so we have expanded our hours to work around our customer’s schedules. Additionally, we are very passionate about community involvement and giving back. TLD: Speaking of giving back, what is the Home Safe Program? CL: The concept came from Homes for Heroes. We provide discounts on our services to those who keep us safe in our homes. Veterans, firefighters, EMT’s, and police officers put their lives on the line for us so I think it’s only fair to give at back to them. TLD: And your contribution to servicemen doesn’t stop there, does it? CL: No, we have recently started programs that give back to veterans specifically. 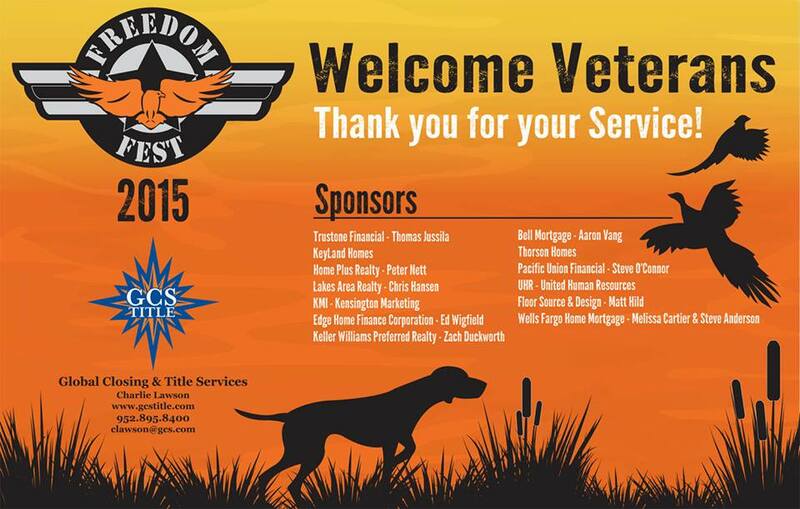 Last year we started Freedom Fest, which provided a full day of fun for 30 veterans at the Horse and Hunt Club. Additionally, we take smaller groups of veterans on fishing trips up to Canada, which is always a big hit. We are always looking for opportunities to give vets the chance to have some fun and clear their minds of their everyday stresses. TLD: Wow. With Zach being a vet himself and our team being committed to giving back to veterans, we appreciate the work your company does. CL: At the end of the day, we want to make sure everyone has a great experience. We’re here to protect our customers the best we can. If you’re looking to speak to a title company, you can reach Charlie here. Thank you to Charlie Lawson and Global Title for being part of our Featured Vendor Friday series!